Alarm clocks? Hasn’t the ubiquitous smartphone relegated them to the dustbin of history? These days your phone can wake you up in a million ways in the morning, chirruping the music track of your choice. But perhaps we’re making these multipurpose devices work too hard. If you long for simpler times, when a single gadget had just one function which it did supremely well, this beautifully rethought bedside companion could be just thing for you. 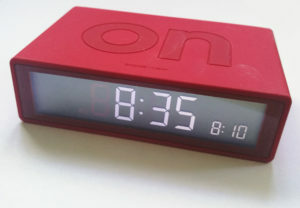 THE LEXON FLIP LR130 ALARM CLOCK is an unobtrusive 10.5 x 6.5 x 3cm, weighing only 100g. Powered by a pair of AAA batteries (supplied), this ingeniously simple British design was conceived by Designwright, the London-based design company run by the brothers Adrian and Jeremy Wright. Their brilliant idea? Take an alarm clock with an electronic display and add an accelerometer. The accelerometer is the tiny chip in every smartphone that knows which way to orient the screen when you rotate it from portrait to landscape. Use this to switch off the alarm when you turn the clock upside down. So the Lexon alarm clock has two modes: ON or OFF, depending on which way up it is. The backlit LCD display on the front rotates accordingly. In the ON mode (unmistakable, as the corresponding top and bottom surfaces are clearly embossed ON and OFF) the main time display is supplemented by a smaller alarm time display in the bottom right corner. The alarm, like the main time, is set from a pair of very easy to use hour and minute click buttons at the rear of the clock. Each ON and OFF surface also has a non-mechanical touch button immediately above the centre of the clock face. In either position this button will switch on the back lighting for four seconds so you can read the time in the dark. In the ON position this button also doubles as a snooze switch, turning the alarm off for five minutes. The alarm is an electronic beep, which starts slowly and gets faster in stages, eventually becoming really annoyingly urgent unless you intervene by snoozing or flipping it. When you’ve (optionally) snoozed enough, for as many five-minute intervals as you need, and are sufficiently awake to get up, simply flip the clock over so that the OFF surface is showing and the alarm will stop. When you get into bed at night, turn the clock so the ON surface is uppermost and you’re ready for your next alarm. And that’s it. A very simply designed alarm clock done right. You’ll find it on the Web in a variety of colours and finishes at Gifts with Style for £28.95. How do you change between 12/24 hour clock? With the clock in either Alarm On or Alarm Off mode, press and hold the Set button at the rear. Normally the display shows static hour/minute values with a flashing colon between them. In Set Mode the values flash and the colon becomes static. Once you’re in Set Mode release the Set button. Press it briefly again and “12Hr” or “24Hr” appears on the screen. This display flashes on and off (the conventional indication that the display can now be changed). In this mode, pressing the Hour button at the rear (adjacent to the Set button) will toggle between “12Hr” and “24Hr”. Pick the one you want and briefly press the Set button again close the operation. I hope that helps. Get back to us if not. set. I have changed the batteries but that hasn’t made any difference. Do you have any idea what the problem might be please? Lindy, have you checked that the new batteries are supplying the proper voltage? You can pick up a simple battery tester on eBay for a couple of quid. If batteries aren’t the problem (and you’re presumably setting the alarm correctly with the alarm time showing in small digits down in the right-hand corner of the screen) I suggest you see if Lexon can help (contact@lexon-design.com). the alarm does not always go off. Any ideas? Sorry to hear that, Sharon. I assume you’ve got the clock in the ON position, with the alarm time showing in small digits in the bottom right corner of the screen? It might be that your battery is low. Have you checked this? For some reason my sister’s alarm is going off loudr than mine. Is there any way you can make it louder? As far as I know, Lena, there’s no way to control the volume. How loud the alarm sounds, of course, will depend on the kind of surface it’s on. If your sister’s Flip is on a hard wood or glass-topped bedside table and yours is sitting on an upholstered surface, that would explain the difference. What happens when you and your sister swap Flips? (You’ve probably tried this, but I have to ask). If the difference continues to worry you, consider taking this up with the manufacturer (contact@lexon-design.com) and let us know what they say. My alarm only has two beeps and then stops ringing. It directly goes to snooze mode even though I didn’t touch it. Sorry to hear that. Without more information, it’s not easy to diagnose your problem. “Going into snooze mode” would imply that it gives a couple more beeps after five minutes. Is this the case? How long have you had the Lexon Flip. Do the batteries need changing? I have noticed that the clock can exhibit some eccentric behaviour towards the end of the batteries’ life. If fresh batteries don’t solve the problem, drop line to the manufacturers (contact@lexon-design.com). Let us know how you get on. Good evening. My alarm clock works in all respects but will not light up so, frustratingly, it cannot be seen in the dark. In short the touch sensitive ‘light’ indicator on the top/bottom off the clock doesn’t seem to have any effect when touched. Am I missing something? It certainly seems as if you’re missing the light, Simon. Obviously, you’ll have tried changing the battery. Beyond that, I can only suggest writing to the manufacturer: contact@lexon-design.com. Do please let me know how you get on. My alarm time only shows 0:00 now and I can’t change it, it used to work until this week. Any ideas? Presumably you’ve checked the battery, Chris. The review sample I have here is still going strong, so this may be a one-off manufacturing fault. My advice would be to drop an email to contact@lexon-design.com explaining the problem. Let me know how that works out. Our lemon flip clock is only setting to military tiime. I do not have the option of 12/24. This one is only giving us the option of the 24 hr clock. How do we switch it to the 12 hour setting? Please do not give me a copy of the manual as I am sitting here with it now and have followed the instructions precisely. Paulette, if the manual isn’t helping it looks as if there may be a hardware or software problem. If it’s software, removing the batteries and replacing them after a short break might do the trick. Have you tried contacting the company that sold you the clock? Or you might try an email to contact@lexon-design.com.